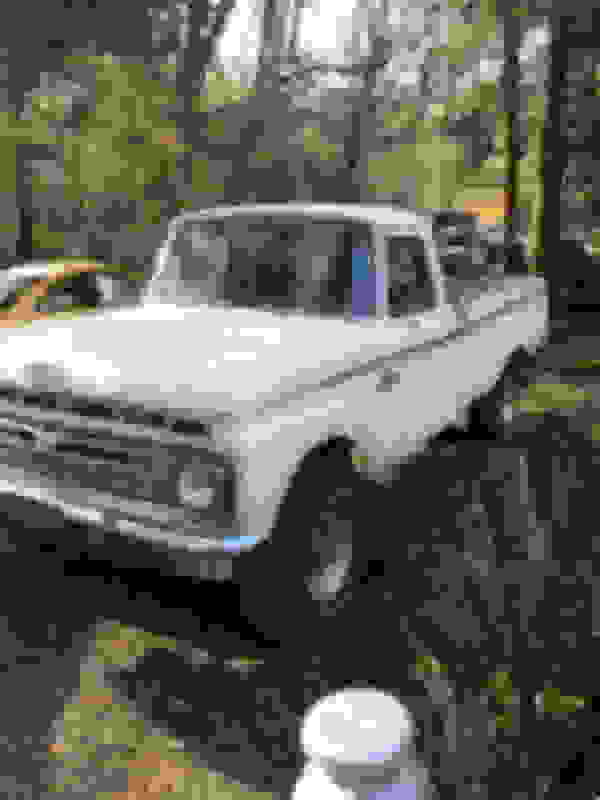 I own a 1966 F250 Camper Special Custom Cab and I'm trying to find out as much as I can about the truck. It was at some point in its life converted to a 4x4 but not sure when or how. Its a rot free California truck. It has dual fuel tanks which I was told was not an option in 1966 although the fuel door looks factory. Where do I find information on this truck if anyone knows? Theres a lot of unknowns with this truck. It has a 352 in it which I started for the first time in an unknown amount of years. I removed the fuel tank from behind the seat and the fuel in it was green, so its been a while. I ran a fuel line into a gas can with an electric fuel pump as the mechanical was not pulling fuel. I have a 390 I will be putting in but want to get it driving first on the 352. Its got a 4 speed, Dana 60 rear and a Dana 44 front. I own a 1966 F250 Camper Special Custom Cab and I'm trying to find out as much as I can about the truck. It was at some point in its life converted to a 4x4 but not sure when or how. Its a rot free California truck. It has dual fuel tanks which I was told was not an option in 1966 although the fuel door looks factory. Where do I find information on this truck if anyone knows? There's a lot of unknowns with this truck. It has a 352 in it which I started for the first time in an unknown amount of years. I removed the fuel tank from behind the seat and the fuel in it was green, so its been a while. I ran a fuel line into a gas can with an electric fuel pump as the mechanical was not pulling fuel. I have a 390 I will be putting in but want to get it driving first on the 352. Its got a 4 speed, Dana 60 rear and a Dana 44 front. 1965/66 F100/250 2WD Camper Special package included 300 I-6 or 352, A/T (C4 with 300 I-6, MX Cruise-O-Matic with 352) or 4 speed M/T, Oil/Amp gauges, heavy duty springs and shocks, xtra cooling radiator, Western Junior mirrors, camper clearance light wiring harness/plug (plugged into feed wire of tail lamp harness), Camper Special fender emblems, tool compartment (Stylesides). 1965/66 F100/250 2WD & 1966 F100 4WD Custom Cab package included anodized aluminum grille and headlamp doors, stainless steel windshield reveal mouldings, 'sweep speedometer' with chrome plastic instrument cluster bezel, foam rubber seat cushion, crush vinyl and woven plastic seat upholstery, dual armrests, door trim panels, padded dash, perforated headliner, Custom Cab nameplates on the doors. The only fuel tank was the in-cab tank. All 1965 F100/250 Camper Specials were 2WD, as were 1966 F250 2WD's, 1966 F100's were available with 2WD or 4WD (not available with A/T). Thank you for that information!! It would take a mighty strong offer to let that beauty go. Even my wife thinks it’s cool and thought it was nicer than the pictures when it arrived. I wouldn't part with it either. I think the 4x4 looks great in this year and it's very rare to see one. 1966 f100 custom cab camper special?